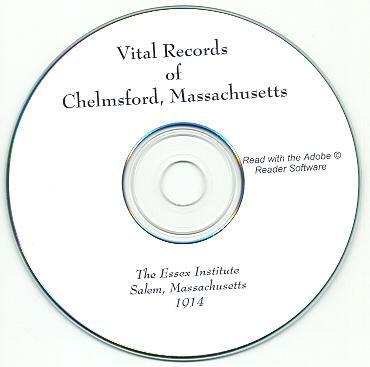 The book, "Vital Records of Chelmsford, Massachusetts, to the End of the Year 1849," Published by the Essex Institute, Salem, Massachusetts, 1914. 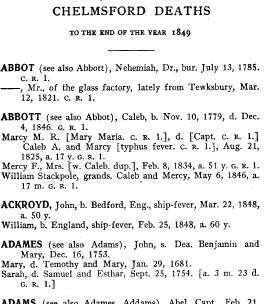 It is a large book listing all of the records of Births, Marriages, and deaths in Chelmsford from its founding to 1849. 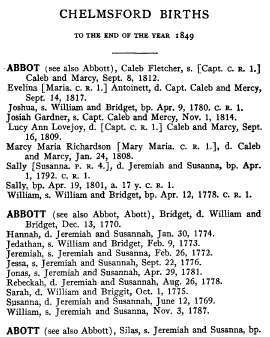 It is not indexed, but the three sections are in alphabetical order & you can search the book using the Adobe Reader 'search' function. 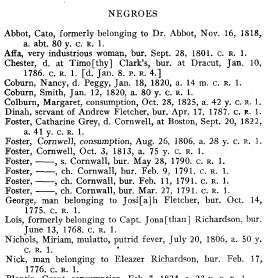 One of the interesting notes on this book is that it does list African American births, deaths, and marriages that were recorded in the town records. Please note: This is not a paper book, it is a scan of the original paper book into the digital Adobe PDF format, written on a CD-ROM. You read this book on your computer using the free Adobe Reader software. 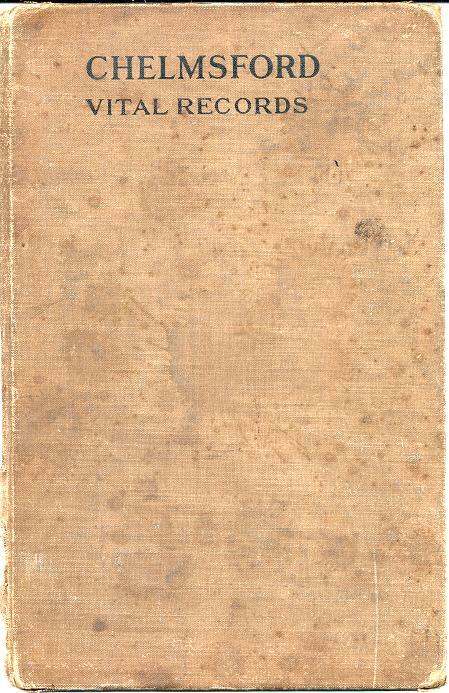 It is a digital version of a hard to find book. If you could find a copy of the 1914 printed book, it would be very expensive. 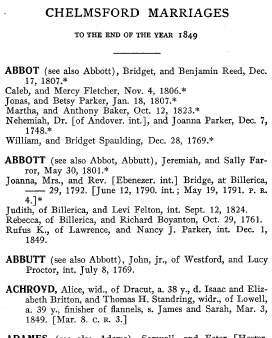 Abbot, Abbott, Abbutt, Abott, Achroyd, Adames, Adams, Addams, Adverd, Air, Alden, Aldridge, Alen, Alexander, Alford, Allen, Ames, Anderson, Andrews, Angel, Anger, Ansert, Anthony, Appleton, Arms, Atwood, Atwood, Austin, Avery, Avril, Ayer, & Ayers. Baaul, Babcock, Bacheller, Badger, Bailey, Baily, Baird, Bake, Baker, Balcom, Baldwin, Bales, Balke, Ball, Ballard, Bancrof, Bancroft, Banke, Bannister, Barat, Baratt, Barber, Bard, Barden, Barett, Barges, Barit, Barite, Baritt, Barke, Barker, Barnes, Barnet, Barns, Baron, Baron, Baros, Barran, Barrat, Barratt, Barren, Barret, Barrett, Barrit, Barrite, Barritt, Barron, Barrot, Barrus, Barry, Barstow, Bartlett, Barton, Batchelder, Bateman, Batemen, Bates, Bathrick, Batman, Bats, Battes, Battes, Batties, Batty, Battyes, Bauk, Bauke, Bauks, Baykey, Bean, Beard, Bearde, Bearse, Bell, Belnap, Bennet, Bettey, Betties, Betty, Bettyes, Biam, Biame, Bickford, Bidgby, Bigsby, Bingham, Birch, Birck, Bird, Bixby, Blackwell, Bladget, Blaisdel, Blaisdell, Blaisdill, Blake, Blanchard, Blasdel, Blasdell, Blazdel, Blazedell, Blazedil, Blazedill, Blazedle, Blesdill, Blodget, Blodgett, Blodgit, Bloged, Bloget, Blogett, Blogged, Blogget, Bloggett, Blogit, Blood, Blotchet, Blotchid, Blunt, Bodwell, Bointon, Bollard, Bolton, Bond, Bonner, Boomer, Bootman, Boott, Born, Borne, Boswith, Bosworth, Bowars, Bowers, Bowles, Boyam, Boyanton, Boyden, Boynton, Brabrook, Bracket, Brackley, Bradford, Bradly, Bradt, Brannon, Bridge, Briggs, Britton, Brooks, Brown, Browne, Bruce, Bryant, Buell, Bulkly, Burbank, Burch, Burden, Burdg, Burdge, Burdick, Burg, Burge, Burgess, Burnett, Burnham, Burrows, Bush, Buterfeeld, Buterfeild, Buterfeld, Buterfelld, Buterfield, Buterfild, Butler, Butman, Butrick, Butterfeeld, Butterfeild, Butterfeild, Butterfeld, Butterfield, Butterfild, Butterick, Butters, Buttrick, Buttrik, Byam, & Byham. Cady, Cadye, Caffertay, Caldwell, Call, Calley, Campbell, Canfield, Carbee, Cargill, Carkin, Carleton, Carlton, Carltotler, Carns, Carpenter, Carr, Carrer, Carroll, Carry, Carter, Carver, Cary, Caryl, Cass, Chadbourne, Chaffee, Chaimberlen, Chaimberlin, Chambarlin, Chambelin, Chamberlain, Chamberlen, Chamberlin, Chamberline, Chamberling, Chamberlyn, Chamberlyne, Chambers, Chandler, Chandler, Chapman, Charles, Chase, Cheever, Chemberlin, Chemberling, Chester, Chevar, Chever, Childs, Chivers, Church, Claflin, Clapp, Clarck, Clark, Clarke, Cleaveland, Cleavelande, Clement, Clemmons, Clerk, Cleveland, Clevland, Clifford, Coborn, Coborne, Cobourn, Coburn, Coburne, Cochran, Cofen, Coffen, Coffin, Cogswell, Cokar, Colborn, Colburn, Colby, Cole, Coleburn, Collar, Coller, Collins, Color, Colwell, Coming, Comings, Comins, Commer, Commins, Conant, Conley, Conn, Connant, Connelly, Conner, Connettle, Cook, Cooke, Coolidge, Coombs, Cooper, Corey, Corie, Corlis, Corliss, Corry, Cory, Coton, Cotten, Cottle, Cotton, Coulborn, Cowdery, Cowdry, Cowen, Coxe, Craft, Craggin, Cragin, Craine, Cram, Crane, Crispe, Critchet, Crockett, Cromell, Crooker, Crooker, Crosby, Crosman, Cross, Crouch, Cumings, Cumins, Cummings, Cummins, Currier, Curtis, Curtiss, Cushing, & Cutler. Dadmun, Dailey, Dakin, Dallon, Dalton, Damon, Dane, Danes, Danforth, Daniels, Daverson, Davice, Davidson, Davies, Davis, Davise, Davison, Daviss, Day, Dean, Deans, Dearden, Dell, Demers, Deuren, DeWitt, Dexter, Dickenson, Dickinson, Dicson, Didson, Diggs, Dill, Dimond, Ditson, Dix, Dodge, Donley, Douglass, Downing, Downs, Dows, Dowse, Drake, Draper, Drew, Druse, Dudley, Dudly, Dulihanty, Dunn, Duppe, Durant, Duren, Durent, Durgin, Durrant, Durrent, Durunt, Dustin, Dutten, & Dutton. Eabert, Eames, Eastabrooks, Easte, Easterbrooks, Eastman, Eaton, Ebert, Edgarton, Edmands, Edson, Edwards, Elexander, Eliot, Ellexander, Elliot, Elliott, Ellis, Emerson, Emery, Emmerson, Emmery, Estabrooks, Esterbrooks, Estherbrooks, Esty, Everett, & Evers. Falkner, Farewell, Farley, Farmer, Farnsworth, Farnum, Farnworth, Farr, Farrar, Farrer, Farrington, Farron, Farror, Farwall, Farwel, Farwell, Fasset, Faulkner, Faver, Fearlow, Fechem, Fellows, Felstead, Felton, Ferrin, Ferwell, Fish, Fisher, Fisk, Fiske, Fitch, Fitchgerls, Fitzgerald, Flacher, Flagg, Flanders, Flatcher, Flecher, Fletcher, Flint, Flood, Floyd, Flynn, Follansbee, Forbush, Ford, Forster, Foster, Foulkner, Fowle, Fox, Frederick, Freeland, Freeman, French, Frie, Frost, Fry, Frye, Fuller, Fullerton, Furber, & Furbush. Galusha, Galusiah, Galutiah, Gamil, Gammel, Garfield, Gebler, Geer, Gelusha, George, Gibson, Giddings, Gidly, Gilchrist, Gillson, Gilmon, Gilmore, Gilson, Glass, Glazier, Gleason, Glezen, Glidden, Glines, Gload, Glode, Glood, Glover, Glyn, Glynn, Gold, Golde, Gole, Golle, Golushaw, Golushua, Goo, Goode, Goodhue, Goodrich, Goodwin, Goofe, Goold, Goold, Goolde, Goole, Goole, Gordie, Gordon, Gorman, Gossling, Goudy, Gould, Goulding, Gove, Goward, Graham, Grainger, Grant, Graves, Gray, Greele, Greeley, Green, Greenleaf, Greggory, Grey, Griffin, Grimes, Grow, Guild, Guod, Gurne, & Gurny. Hadan, Hadley, Hagget, Haggit, Hailstone, Hald, Halde, Hale, Haley, Halkerston, Hall, Halle, Hallett, Hamblet, Hamblett, Hammon, Hancock, Hancok, Handley, Hans, Hanson, Harad, Hardey, Hardy, Haris, Hariss, Harman, Harper, Harrington, Harris, Harriss, Hart, Harton, Hartwell, Harvel, Harvil, Harvy, Harwod, Harwood, Haskell, Hasselton, Hasting, Hastings, Hatch, Hathaway, Hathron, Haward, Hawood, Hay, Hayden, Hayes, Haynes, Hayward, Haywood, Heald, Healey, Healy, Hearrick, Heild, Heiley, Heldereth, Heldreth, Heldrith, Helldreth, Hemmingway, Henchman, Hennon, Herick, Herod, Herrick, Herrin, Herring, Hervey, Herwood, Heyward, Heywood, Hibbard, Hicks, Hide, Hilbert, Hildereth, Hildreath, Hildretch, Hildreth, Hildrick, Hildrith, Hill, Hilldereth, Hilldreath, Hilldreth, Hilldrith, Hills, Hilton, Hinchman, Hincksman, Hinkley, Hirsch, Hoar, Hobart, Hobbs, Hobson, Hodgeman, Hodges, Hodgman, Holden, Holdgate, Holland, Hollis, Holman, Holmes, Holt, Hoostler, Hopkings, Horn, Horseley, Horton, Hoseller, Hosmer, Hovey, How, Howard, Howe, Howerd, Howland, Hoyt, Hubbard, Huddleton, Hunt, Hunter, Hunting, Huntington, Hursch, Hussey, Huston, Hutchens, Hutcherson, Hutcherson, Hutchings, Hutchins, Hutchinson, & Hyde. Ilesly, Ilsley, Inglee, Ingraham, Ives, & Ivory. Jacobs, Jameson, Jaques, Jaquesh, Jaquith, Jefes, Jeffraey, Jeffray, Jeffs, Jenkins, Jenness, Jewel, Jewell, Jewett, Johnson, Johnston, Jones, Joslin, Joslyn, & Josselyn. Kedder, Keemp, Keies, Keiys, Kelley, Kemp, Kempe, Kendal, Kendall, Kenney, Kennington, Kennon, Kenny, Kent, Key, Keyes, Keymp, Keys, Keyse, Kidder, Kider, Killom, Kimball, King, Kitterage, Kitteridge, Kittredge, Kittridge, Knecttle, Knowles, Knowlton, Kyes, & Kyess. Laken, Lamb, Lamson, Lancey, Lancy, Landlee, Landry, Lane, Langle, Langlee, Langley, Lapham, Larcom, Larey, Larkin, Larned, Laughton, Lawes, Lawrance, Lawrence, Laws, Lawson, Leach, Leaking, Leavitt, Lee, Leighton, Lemon, Leonard, Lepene, Lernet, Leveston, Levestone, Levingston, Levingstone, Lewis, Lewis, Libbee, Libbey, Libby, Lincoln, Lindsey, Linkfield, Liscom, Litchfield, Littleale, Littlehale, Livermore, Livingston, Livingstone, Lloyd, Lock, Longley, Longly, Loock, Lord, Loring, Lothrop, Lovejoy, Loven, Lovjoy, Lowell, Lufkin, Lun, Lund, & Lyon. Macfarlain, Maciney, Mackaslin, Mackeney, Mackeny, Macklain, Maclain, Maclaine, Maclane, Mahars, Malcom, Maning, Mann, Manning, Mansfeild, Mansfield, Mansor, Mansur, Marble, March, Marchall, Marcy, Marden, Marshal, Marshall, Marston, Martain, Marten, Martin, Mason, Masse, Mathes, Maynard, McAllister, McCarthy, McClarran, McClary, McClench, McClenche, McClining, McCluskey, McClusky, McConnihie, McCoy, McDaniel, McEmery, McEneaney, McEneany, McEntire, McFarlin, McFarlin, McGlauthlia, McGlauthlin, McGrath, McGuinas, McIntere, McIntire, McIntyre, McKavor, McKee, McKeever, McLain, McLane, McLenna, McMurphy, McQuestion, McQuston, Mead, Meads, Mear, Mears, Meers, Mellen, Melven, Melvin, Merideth, Merrell, Merriam, Merrick, Merril, Merrill, Messer, Miller, Minat, Minot, Minott, Miriam, Moar, Moars, Montague, Monteeth, Mooars, Moody, Mooers, Moor, Moore, Moores, Moors, More, Mores, Morgan, Morrell, Morrill, Mors, Morse, Mottley, Moulton, Mountfort, Mounthforth, Mullin, Munger, Munroe, Murfey, Murphy, Muzzy, & Myrick. Nason, Naylor, Neef, Nelson, Newcomb, Newel, Newell, Nichols, Nickles, Noble, Nolin, Nolte, Nourse, Noyce, Noyes, Noys, Nuel, Nut, Nutten, Nutter, & Nutting. Obear, Ober, Obier, Oliver, Ong, Osborn, Osbourn, Osburn, Osgood, & Ozgood. Packard, Page, Palmer, Parchurst, Parckard, Paris, Parise, Parish, Park, Parker, Parkhurst, Parkhust, Parkis, Parlin, Parmenter, Parrish, Parrot, Parrott, Parrt, Parry, Patch, Pathio, Patin, Patten, Patterson, Pattin, Pattison, Payson, Peabody, Peach, Peacock, Pearce, Pearson, Peavey, Peck, Pecken, Peckens, Peckins, Peirce, Peirs, Pellat, Pelsue, Pennington, Peram, Perce, Perham, Perigo, Perker, Perkhast, Perkhurst, Perkhust, Perkins,Perley, Perram, Perrum, Perry, Perum, Phelps, Philbrick, Philips, Phillip, Phillips, Phipps, Pickering, Pierce, Pike, Pilsbury, Pinney, Piper, Pitts, Plaisted, Pollard, Pollord, Pool, Poole, Poor, Porter, Powars, Power, Powers, Pratt, Pray, Prentice, Prentis, Prentiss, Prescott, Prescut, Prescutt, Preston, Prichtte, Pro, Prockter, Procter, Proctor, Proctter, Prookter, Provancha, Pulsifer, Putfark, Putman, Putnam, Putney, & Putnum. Raiment, Ramsdill, Rand, Ranger, Ray, Rayment, Raymond, Raynor, Rea, Read, Reader, Reading, Record, Redding, Reddington, Redland, Reed, Reeding, Relph, Remme, Rennick, Resch, Rice, Rich, Richardson, Richardsun, Richarson, Richerdson, Richerson, Richeson, Richmond, Rider, Ridings, Right, Rimmer, Ripley, Ritchardson, Ritchardsun, Ritcherdson, Ritcheson, Robbens, Robbins, Robens, Robie, Robin, Robines, Robins, Robinson, Robison, Roby, Rofe, Roff, Rogers, Roggers, Rollins, Roper, Ross, Rouf, Round, Rouse, Rousoe, Row, Rowe, Rowell, Ruggles, Ruggs, Rumrell, Rush, Russ, Russel, & Russell. Salendin, Sampson, Sanborn, Sanders, Sanderson, Sanger, Sargeant, Sargent, Sarnders, Satle, Saunders, Savoy, Sawin, Sawtell, Sawyer, Saxson, Scales, Scammell, Scott, Scripture, Searle, Searls, Semple, Senter, Serll, Sevoie, Shattuck, Shaw, Shead, Shed, Shedd, Sheed, Shepard, Sheperd, Shephard, Shepherd, Shepley, Sheply, Sherburn, Sherin, Sherman, Sherwin, Sherwood, Shettleworth, Shiple, Shipley, Shiply, Shirtliff, Shores, Shurtleff, Shurtliff, Silver, Simkins, Simonds, Simons, Sims, Skidmoor, Skidmore, Skinner, Slicer, Small, Smith, Snow, Spafford, Spalden, Spaldin, Spalding, Spaldyng, Sparhawk, Sparkes, Sparks, Spaulden, Spauldin, Spauldine, Spaulding, Spauldinge, Spauldyng, Spofford, Spolding, Sprage, Sprague, Sprake, Stacey, Starrett, Start, Stearns, Steavens, Stedman, Steele, Steevens, Stephens, Sterns, Sterrett, Stetson, Stevens, Sticklemire, Sticklemore, Stickney, Stockbridge, Stodard, Stoddard, Stokes, Stone, Stow, Straton, Stratton, Sulivan, Sullivan, Sumner, Swallow, Swalo, Swalow, Swan, Sweet, Sweetser, Swetman, Swett, Swettman, Swift, Syffermann, & Symmes. Taft, Tainter, Talbott, Talbut, Talor, Tarbel, Tasker, Tay, Tayler, Taylor, Temple, Templeton, Thare, Thomas, Thompson, Thomson, Thorndick, Thorndicke, Thorndike, Throreau, Thurlow, Tiller, Tillson, Tittle, Todd, Tompson, Tomson, Toothaker, Torrey, Torroy, Townsend, Trahant, Trainer, Treat, Trough, Trowbridge, Trull, Tuck, Tucker, Turner, Tuttel, Tuttle, Twiss, Twist, Tyler, Tylor, & Tyng. Underwad, Underwod, Underwood, Undorwood, Upham, Upton, & Usher. Van Doorn, Vance, Varnam, Varnum, Vernun, Vickers, Viles, Vincent, Vinton, Virgen, Virgin, Voce, Voirgen, Vose, & Vryling. Waddell, Wadell, Wait, Waite, Waldo, Waldow, Walker, Wallace, Walldo, Walldou, Walldow, Wallker, Ward, Warden, Ware, Warin, Warine, Waring, Warn, Warren, Warrin, Warring, Washer, Waterhouse, Waters, Watkins, Watriss, Watson, Wattell, Way, Weaver, Web, Webb, Webber, Webster, Weebe, Welch, Weld, Wellington, Wellman, Welsh, Wendel, Wendell, Wentworth, Wesen, Wesson, Wetherbee, Wever, Weymouth, Whealer, Wheat, Wheeler, Wheelock, Wheelwright, Wheler, Whetney, Whipple, Whitcomb, Whitcombe, White, Whitemore, Whitherell, Whiting, Whitnee, Whitney, Whittaker, Whittaws, Whittemore, Whittier, Whitting, Whittney, Whitwell, Wier, Wiggin, Wight, Wilbur, Wilder, Willard, Wille, Williams, Williston, Willoughby, Willowby, Willson, Wilson, Wily, Winch, Winchester, Wincoll, Winn, Winning, Winship, Winslow, Witherell, Withington, Wood, Woodhead, Woods, Woodward, Worchester, Worin, Worrin, Worster, Worthin, Wright, Wrighte, Wyer, Wyet, & Wyman.